So, what is your Soul trying to tell you right now? 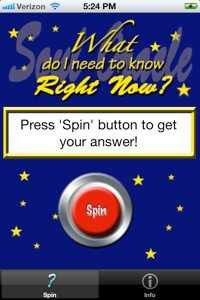 Find out with this fun app from Souls on A Journey. Press the button and watch the wheel spin, the stars flash, and hear the chimes ring while it comes up with a piece of wisdom that’s right for you right now! All pieces of wisdom come with “More” information for you. Just a bit more on the topic to help things become clearer. Some wisdoms come with “Even More” just in case you want to take things a little deeper. 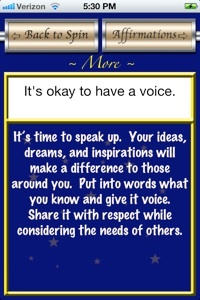 And some come with an “Affirmation” for really helping to bring things home. See Soul Oracle in the App Store! DISCLAIMER: These words of wisdom and insight are for entertainment purposes only and are not intended to be used as a diagnosis and/or replacement for psychological, medical, therapeutic, or spiritual treatment or counseling.